We are required to both downplay the seriousness of HIV and to stress its terrible impact. Here’s the view I favor. Describing the impact of HIV is complicated. It’s a balancing act whose language depends on who is listening. But can we navigate that turf—or those turfs—with honesty, credibility and integrity? To a newly diagnosed person, we stress the normalcy of life with HIV, that a person diagnosed at 20 can expect to live to 70 and beyond. We suggest that treatment is easy today, with side effects unlikely. The message is bouncy and business as usual, with a few pesky reminders about adherence—and about disclosure where required by law. To the HIV-negative person, it’s quite different; we make clear that HIV is a disease to be avoided at all costs. To those who fund us, the message we send is that HIV remains a pandemic and a threat that must be wrestled to the ground at any cost. We argue among ourselves over whether HIV really is a “chronic manageable condition.” We argue over whether stigma is better or worse than it once was. Also unique to HIV is criminalization and a host of societal ills that both act as a cultivator for HIV and worsen its impact. There is inequality, and there is unfairness. There is shame, there is self-stigma. There are workplace and housing issues and gender issues and race issues and access to treatment issues. HIV is one complicated disease. Given its complexity, I’d argue there is ample room for differing opinions on its impact. 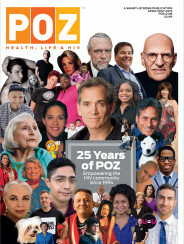 For those who are at peace with HIV, have accepted it into their lives, there is room. For those who rage at the machine that is HIV, and fight it hard, sometimes successfully, sometimes not, there is room too. Our view of HIV is inevitably coloured by our own history. I’ve had it easy. I was diagnosed in 1993 and launched almost immediately into both becoming a buddy for a fellow in late stage AIDS while taking care of myself via a series of support groups. Though I stayed calm in the valley of death, mortality was constantly on our minds. You can turn to the musical Rent to remind us what support groups meant in the ’80s and ’90s. “Will I lose my dignity? Will someone care? Will I wake tomorrow from this nightmare?” I remember asking once whether my dog would be allowed on my deathbed, when the time came. Living with HIV in 2018 is, by any standard, easier for many compared to those terrible days. True, we who survived bear the scars today, both physical and mental, but we are alive. And we can afford to send upbeat messages to the newly diagnosed. We can strive for normalcy. The U=U campaign—meaning “undetectable = untransmittable”—helps us along that path. Despite or perhaps because of this, my own experience has tended to favour a picture of HIV more in line with that we tell the newly diagnosed—“You will be alright, you can have a normal life”. If we wear the T-shirts that say “HIV is not a crime," or “No shame about being HIV+” the implication is that normalcy is what we strive for. There is absolutely nothing wrong with that, even if for some it is only a dream. There are moments, though, when we must recognize these are not normal times. It is not normal for the world to be faced with an infectious disease that, 35 years in, has no cure and kills 1 million people a year. While the world continues to see 1.8 million new infections annually, we need to continue to speak, and act, with concern. And if our own lives happen to be relatively normal, that privileged experience of HIV is decidedly not what many have to deal with. We also need funders to understand that HIV is still a threat and an affront to humanity and we can only do that by stressing how serious it can be, not how manageable it is. Thus we are required to make living with HIV as normal as possible while stressing the abnormal nature of the epidemic. It’s a complicated balancing act but it’s what we do. We as a community have had a lot of practice—and mostly we get it right.